A host of movie stars, journalists and industry folk (plus one blogger) gathered at London’s County Hall on Monday night for the Evening Standard British Film Awards. It was a short and simple affair, with only nine awards, and if you actually care who won you can find out here. I didn’t take a lot of pictures and I’ve got to go out in a minute, so forgive me if I fall back on the old ‘list of highlights’ format. 1. 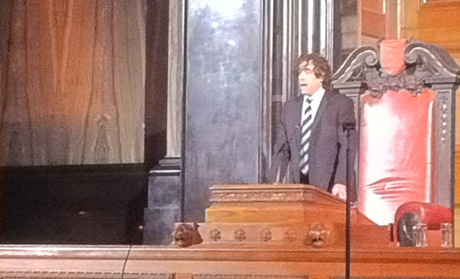 The night was hosted by Steven Mangan from the Barclays adverts. 2. 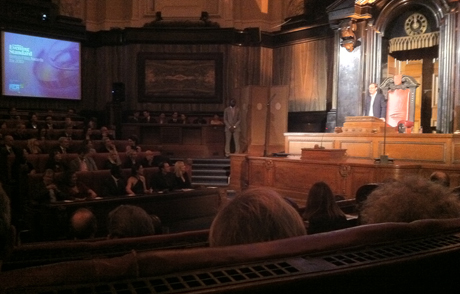 The awards themselves took place in County Hall’s bizarre lecture room, which looks a bit like the House of Commons. Or the Ministry of Magic. 3. The ‘mingling’ portion of the evening took place next door in London’s worst tourist attraction, the Movieum of London. Moët were a sponsor so we all had a lot of champagne while we admired the crappy Star Wars replicas. 4. John Hurt presented an award. I closed my eyes and imagined I was watching a live episode of Human Planet – presumably one looking at the remarkable way of life of the humble film critic. 5. At one point I saw one of the awards lying around and got somebody to take a picture of me holding it. It turned out to be Clio Barnard’s. 6. Andrew Garfield sent an incredibly long video message from the set of the new Spider-man movie. 7. We ended up in the hotel bar afterwards with the NEDS people. They won Best Film so spirits were high, especially those of a beautifully-kilted Peter Mullan. Watch out Robbie Collin, you’ve got competition. 8. We walked across the river to Trafalgar Square. 9. I bought some crisps in Tescos. 10. We went to the Phoenix Artist Club and couldn’t get in. 11. We went somewhere else.